Dedicate yourself to a healthy lifestyle with these food, nutrition and exercise tips. There's no better way to start your morning than with a healthy breakfast. Include lean protein, whole grains, fruits and vegetables. Try oatmeal cooked with low-fat milk, sliced almonds and berries, or top a toaster waffle with low-fat yogurt and fruit. Find more quick breakfast ideas at www.eatright.org/nutritiontipsheets. Fruits and veggies add color, flavor and texture plus vitamins, minerals and fiber to your plate. Make 2 cups of fruit and 2 ½ cups of vegetables your daily goal. Don't let winter stop you from enjoying produce. It may be harder to find fresh options, but frozen and canned are great alternatives. See "20 Ways to Enjoy More Fruits and Vegetables" at www.eatright.org/nutritiontipsheets. Do you know if you're eating the proper portion size? Get out the measuring cups and see how close your portions are to the recommended serving size. Using smaller plates, bowls and glasses can help you keep portions under control. Use half your plate for fruits and vegetables and the other half for grains and lean meat, poultry, seafood or beans. To complete the meal, add a glass of fat-free or low-fat milk or a serving of fat-free yogurt for dessert. Visit www.choosemyplate.gov. Regular physical activity lowers blood pressure and helps your body control stress and weight. Start by doing what exercise you can for at least 10 minutes at a time. Children and teens should get 60 or more minutes of physical activity per day, and adults should get two hours and 30 minutes per week. You don't have to hit the gym-take a walk after dinner or play a game of catch or basketball. Healthy snacks can sustain your energy levels between meals. Whenever possible, make your snacks combination snacks. Choose from the MyPlate food groups: whole grains, fruits, vegetables, low-fat or fat-free dairy, lean protein or nuts. Try low-fat yogurt with fruit, whole-grain crackers with low-fat cheese, or a small portion of nuts with an apple or banana. For more snack ideas, see "25 Healthy Snacks for Kids" and "Smart Snacking for Adults and Teens" at www.eatright.org/nutritiontipsheets. Get to Know Food Labels. Ever wonder about what the numbers in the Nutrition Facts panel really mean? Or, the difference between "reduced fat" and "low fat?" The Food and Drug Administration has strict guidelines on how food label terms can be used. To learn more about food labels, see "Shop Smart - Get the Facts on Food Labels" at www.eatright.org/nutritiontipsheets. Whether you want to lose weight, lower your cholesterol or simply eat better, consult the experts! Registered dietitians can help you by providing sound, easy-to-follow personalized nutrition advice and put you on the path to losing weight, eating well and reducing your risk of chronic disease. Learn more about RDs at www.eatright.org/RD. The Centers for Disease Control and Prevention estimates that roughly one in six Americans gets sick from foodborne disease each year. Reduce your chances of getting sick by practicing proper hand washing. Separate raw meat, poultry and seafood from ready-to-eat foods like bread and vegetables. Use a food thermometer to make sure food is properly cooked. Refrigerate food quickly at a proper temperature to slow bacteria growth. Learn more about home food safety at http://homefoodsafety.org. Cooking at home can be healthy, rewarding and cost-effective. Resolve to learn some cooking and kitchen basics, like how to dice an onion or how to store herbs and spices. The collection of "How do I..." videos at www.eatright.org/howdoi will get you started. You can dine at a restaurant and stick to your healthy eating plan! The key is to plan ahead, ask questions and choose foods carefully. Think about nutritious items you can add to your plate - fruits, veggies, lean meat, poultry or fish - and look for grilled, baked, broiled or steamed items. See "Healthy Eating on the Run" at www.eatright.org/nutritiontipsheets. Research shows that family meals promote healthier eating. Plan to eat as a family at least a few times each week in 2014. Set a regular mealtime. Turn off the TV, phones and other electronic devices to encourage mealtime talk. Get kids involved in meal planning and cooking and use this time to teach them about good nutrition. For more family mealtime tips, visit www.kidseatright.org. Whether it's a brown bag lunch for work or school, make it a healthy lunch packed with nutrition. 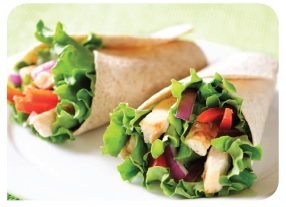 Prevent brown bag boredom with these healthy lunch ideas. They're easy to fix the night before and ready to go in the morning. Try whole-wheat couscous with chick peas or black beans; whole-wheat tortilla filled with chicken, mushrooms, onions and tomatoes; baked potato topped with broccoli, low-fat cheddar cheese and salsa; or spinach salad with sliced pear, red onion and low-fat feta cheese. Keep lunches safe with tips from http://homefoodsafety.org. Our bodies depend on water to regulate temperature, transport nutrients and oxygen to cells, carry away waste products and more. For generally healthy people who live in temperate climates, the Dietary Reference Intakes from the Institute of Medicine recommend a total daily beverage intake of 13 cups for men and 9 cups for women. Add more nutrition and eating pleasure by expanding your range of food choices. When shopping, make a point of selecting a fruit, vegetable or whole grain that’s new to you or your family. Choose a restaurant that features ethnic foods or find new flavors at community food festivals. Try different versions of familiar foods like blue potatoes, red leaf lettuce or basmati rice. Academy of Nutrition and Dietectics staff registered dietitians. ©2014 Academy of Nutrition and Dietetics. Reproduction of this tip sheet is permitted for educational purposes. Reproduction for sales purposes is not authorized. Oxford® is a registered trademark of UnitedHealth Group and its subsidiaries.